History of Vegetarianism - The Ethics of Diet - Apollonius of Tyrana c.3 B.C. - c.97 A.D.
Apollonius of Tyana c.3 B.C. - c.97 A.D. 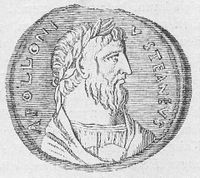 Among the illustrious earlier contemporaries of Plutarch who practised no less than preached rigid abstinence, Apollonius of Tyrana, the Pythagorean, one of the most extraordinary men of any age, deserves particular notice. He came into the world in the same year with the founder of Christianity, B.C. 4. The facts and fictions of his life we owe to Philostratus, who wrote his memoirs at the express desire of the Empress Julia Domna, the wife of Severus. "Apollonius to the Monopolists of Corn in Aspendos, greeting : The earth is the common mother of all, for she is just. (2) You are unjust, for you have made her the mother of yourselves only. If you will not cease from acting thus, I will not suffer you to remain upon her." Philostratus assures us that "intimidated by these indignant words they filled the market with grain, and the city recovered from its distress." "The proclamation of birth of Apollonius to his mother by Proteus, and the incarnation of Proteus himself - the chorus of swans which sang for joy on the occasion - the casting out of devils, raising the dead, and healing the sick - the sudden disappearances and reappearances of Apollonius - his adventures in the cave of Trophonius, and the sacred Voice which called him at his death, to which may be added his claim as a teacher to reform the world - cannot fail to suggest the parallel passages in the Gospel history. . . Still it must be allowed that the resemblances are very general, and on the whole it seems probable that the life of Apollonius was not written with a controversial aim, as the resemblances though real, only indicate that a few things were borrowed, and exhibit no trace of a systematic parallel." - Dictionary of Greek and Roman Biography. Edited by Wm. Smith. Ll.D. So great was the estimation in which he was held, that the emperor Alexander Severus (one of the very few good Roman princes) placed his statue or bust in the imperial Larium or private Chapel, together with those of Orpheus an of Christ. Cf. Virgil, Goergics II. : "Fundit humo facilem victum justissima Tellus."